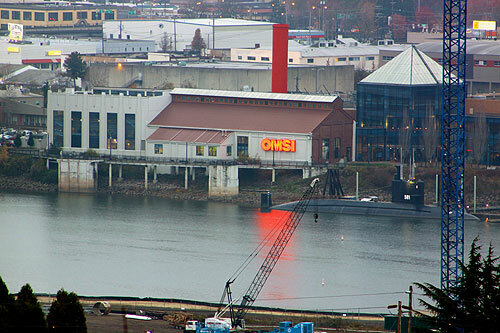 (Portland, Oregon) – Portland’s OMSI will give visitors a first-class ticket to an almost firsthand view of a major milestone in space travel history. On December 4, the famed museum hosts a live, big screen broadcast of the first launch of Orion, Exploration Flight Test-1, as it takes off from Cape Canaveral Air Force Station in Florida. 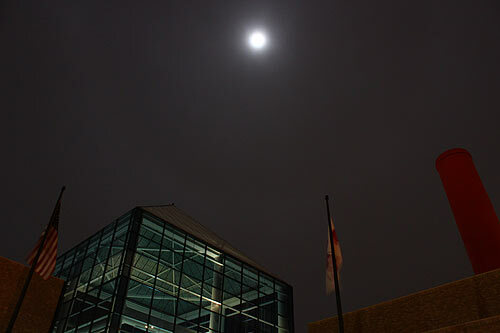 (Above: the moon above OMSI). This lift-off at OMSI Planetarium begins at 3:00 a.m. with the launch scheduled at 4:05 a.m. and the splash down taking place at approximately 8:00 a.m.. Admission to the televised launch is free and seating is on a first-come, first-served basis. The Orion spacecraft is a key component of the NASA human space exploration system that will provide an entirely new capability for the United States – a flexible system able to launch crew and cargo missions, extend human presence beyond low-Earth orbit, and enable new missions of exploration throughout our solar system. Orion’s first mission will set NASA on the path to accomplishing those goals. Beginning at 3:00 AM, guests are invited to learn about Orion, view the flight from launch to splashdown, and enjoy fun hands-on activities throughout the event. Guests will hear NASA commentary prior to Orion’s launch, and learn about the flight and mission objectives through interviews with experts at NASA, Lockheed Martin and United Launch Alliance. They will see the launch pad and launch control center, and feel as though they are at the launch site when the main engines ignite.